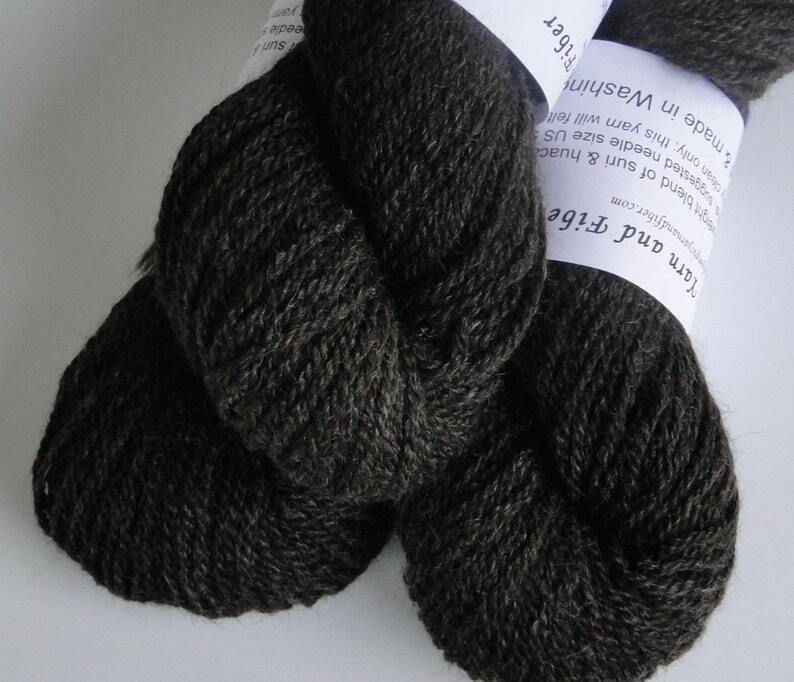 A blend of 65% black huacaya alpaca and 35% rose-gray suri alpaca (the fiber is from our two youngest girls, Moonshadow and Ember), the final product is a delicious dark chocolate color with beautiful luster. This yarn is a DK-weight, approximately 125 yards per 57 g (~ 2 oz) hank. Suggested needle size would be a US5 or US6. Alpaca fiber can be felted if desired. The color is 100% natural, no dye was used. See third photo above for an example of a scarf that I knit using this yarn. All of our Olympic Yarn and Fiber brand yarns are made by me in my small-scale commercial yarn mill, located on our alpaca ranch in Montesano, WA. TRY BEFORE YOU BUY! I will gladly send you a few yards of this yarn to see, feel, knit, crochet, and experience for yourself. Click "Ask a Question" above to let me know that you would like a sample; please include your mailing address. I promise that I will not use your address for any other purpose. So soft and a beautiful color. This will work well. Very soft, beautiful yarn that I will get great projects from. Fast service too, only slight delivery delay due to weather. I strive to send your order as quickly as possible and will do my best to ship your item(s) within one business day after full payment has been received. ALL PATTERNS are sold as digital files which can be downloaded from the purchaser's Etsy account. ALL YARN orders will be shipped via USPS first-class mail. If you would like to add insurance, extra mailing services, or upgrade to Priority or Express shipping, please send me a note prior to making your purchase. It will be my pleasure to provide you with a price quote for any additional requested services. Olympic Yarn and Fiber and The Alpaca Yarn Shop is not responsible for lost, stolen, or damaged packages. Any claims for such must be made by the buyer with the US Postal Service.